Shiba Park is one of Tokyo's 'famous sites', making this print a good souvenir for visitors. 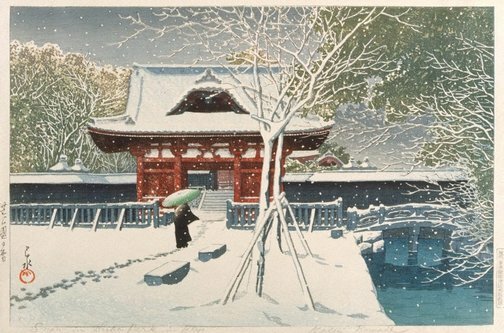 The seasonal reference of the snow follows the 'ukiyo-e' convention, while the chiaroscuro and absence of outline indicate the influence of watercolour painting: a reassuring blend of the traditional and the modern, with richly overlaid colours creating subtlety and depth. The Asian Collections, AGNSW, 2003, pg.284. Signed l.l., in Japanese, ink "Hasui [and artist's seal]". Signed l.r., pencil "Hasui Kawase". Not dated. The Asian Collections Art Gallery of New South Wales , 'Individuality in early 20th century works on paper', Sydney, 2003, 284 (colour illus. ).